Can you get all your label printing for the day done with one printer? Brady Corporation (Brady) believes the answer is yes, which is why the slogan for their new BMP®41 Label Printer is "One and done." 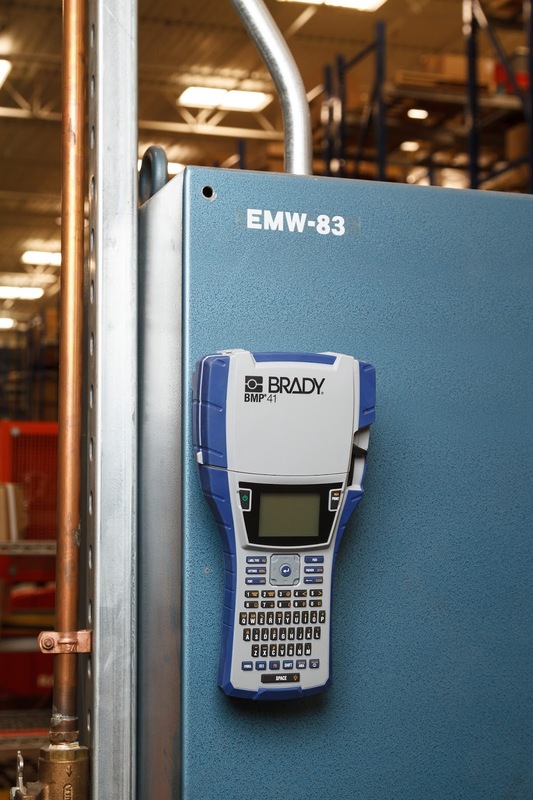 Made for on-the-job labeling, the portable, mid-range Brady BMP41 Label Printer was created with electrical, voice & data communications, telecommunications, and general industrial applications in mind. The rugged (it can survive a six-foot drop) BMP41 is easy to use and versatile enough for everyday jobs and one-off tasks, alike. With the BMP41 thermal transfer printer as a standard tool, electricians, network engineers, and other mobile workers can complete their labeling needs quickly and on-the-spot. To provide high-quality, professional label printing to the user, the BMP41 has a variety of materials and accessories available. Using the proper labels/ribbons and add-ons ensures durable, long-lasting labels and problem-free printing. The BMP41 shares many of the same M-Series consumables as the Brady BMP51 and BMP53 Printers (BMP51/53 consumables larger than 1" wide, as well as various BMP51/BMP53 consumables under 1", (such as lab materials) will not function in the BMP41 printer). 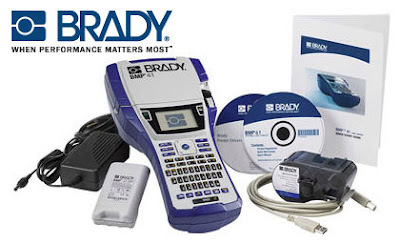 Brady BMP41 replacement parts and accessories include the BMP41-BATT Battery, BMP41-HC Hard Case, BMP41-QC External Battery Quick Charger, BMP41-AC AC Adapter, BMP41-USB USB Cable, and BMP41-MAGNET Magnetic Accessory. The BMP-MAGNET is a cool accessory that allows the user to work hands-free by attaching the magnet to the back of the BMP41 and sticking it to a magnetized wall or surface. 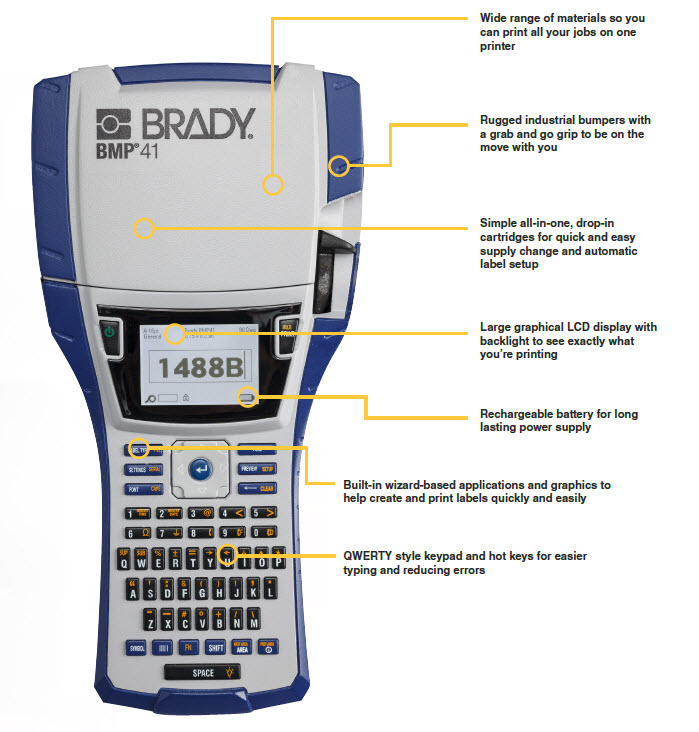 With its combination of Brady quality label materials, rugged exterior, built-in functions, and ease of use, Brady’s BMP41 Label Printer looks to be the one-and-done tool for a variety of applications. Add to that its excellent low cost and it just makes sense to equip each technician with their own unit for on-the-go, uninterrupted productivity. For more information about, or to place an order for, the Brady BMP41 Label Printer please visit QSource.com. You can also give us a call at 800-966-6020 or contact us via email. If there's a product or topic you'd like to see The Q Source Resource write about please let us know. We'd also appreciate if you share this blog post with your friends and colleagues via the social media links below. If you have questions or comments about the BMP41 Label Printer or related topics please leave us a message in the comments section.